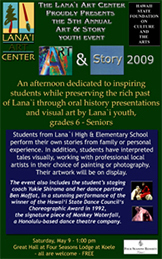 This multi-disciplinary, month-long project, supported by the Hawaii State Foundation on Art & Culture and the National Endowment for the Arts, preserves both the local culture and living history of Lanai by offering participating students grades 6-12 the choice of learning storytelling, a visual art medium of their choice, or both. Student choices have run the gamut: art & storytelling, art discipline only, storytelling only, two art disciplines. 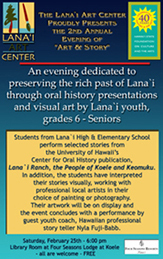 The program features dedicated students from Lanai High and Elementary School who work entirely on their own time after school for a solid month, investing an average of 40 hours. Storytelling students perform selected stories garnered from their own experiences, family elders or the University of Hawaiis Center for Oral History publication, Lanai Ranch: the People of Ko`ele and Keomuku. The Art component consists of students who have interpreted their stories visually; in their choice of painting or photography, and their artwork is on display. 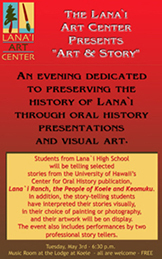 The event includes a performance by a professional story teller. * I learned so much about myself like confidence and self-esteem. I didn't know I could be that open in public. My story made me so proud of being a Hawaiian musician. All of us really came out of our shells to put on a good show, there was so much growth in our performances and overall confidence. * I liked that you can learn so much in just three weeks. * If I didn't participate, I would've been that shy person in the corner. Storytelling brought out the spirit in me. If I didn't, I would have been lost. * Photography was a totally awesome experience and I learned a lot. My favorite part was finding out I could take awesome pictures and that even a picture you don't plan out can turn out to be the best one. The coolest thing I learned was how to capture a moment, like freezing time. * I liked being able to open up, especially to a story of my own, in a way where you can drop all guards but still be in control. I liked Aunty Nyla. Overall though, I loved the way I touched the people and the way they touched me. I liked seeing the confidence in the kids as they all, one-by-one, got up said what was needed to be said all in a manner of which said everything would be okay. Its encouraging seeing all the kids who painted beautiful pieces, or took a photo of amazing scenery, and those who decided to tell a story set to teach and touch. * I liked the chance for us kids to express artistic ability. This program helped us all believe in ourselves. I learned that I am a very good in front of an audience and a good artist, too. * What I liked best about photography was how we could have our own style and it would still be right. The coolest thing I learned was how something so simple can turn out so cool. * What I liked best was the chance to be creative and the thought of calling what you do art. I learned that I can be good at something if I try to do it. * I liked seeing my story come alive and people being proud of me. I learned that I can't be afraid of anything. * Painting was fun and I got a lot out of it and I can now stand in front of lots of people without being a nervous wreck. I learned I really can do whatever I want. This program rocks! I hope it goes on forever. * If I could, next year I would want to do photography again and try painting, too. I really hope this program continues and hope more people get to do it next year. * The thing I liked most about this project is that I got to re-live someone's memories. Aunty Nyla helped me motivate myself, but the best thing was performing for an audience. * Being able to work with other students and teachers, but basically I liked everything. * This is the first time I ever did anything like this. It was fun to perform in front of people. * What I liked about this project was performing in front of people, it taught me to do what you have to do. * I learned to believe in yourself and be committed to whatever you're doing. * IT WAS FUN!!!!!!! I want to do it again next year. * I enjoyed this project a lot. After presenting my painting, I went home and started painting again with the supplies and canvas I got! * I learned how to be confident and that you can put yourself in someone else's place. * I learned that I have the ability to tell a story just like a real storyteller. * I learned that performing in front of people is harder than I thought. * I learned that if I believe in myself than I do much better than when I think I can't do something. * I learned that even though I did not know how to paint, I could do an awesome job. * I learned that imaginary things can feel real. I learned things about the island that I didn't know. *What I liked most is that we get to express ourselves in individual ways. * I liked that we got to connect with other students and it was fun to help the students who weren't in last year's program. I enjoyed working and seeing students outside of the everyday classroom routine. Instead of their "teacher" I was their "coach". Interestingly, this has led to better relationships inside the classroom. Now in the fourth year, I have learned the longer I'm involved in the program, the more I have to contribute. For students, the self-confidence and validation they gain is important, while peer relations also grow as a result of this project. I really loved working with the kids and getting to see them learn while having fun, and it inspired me to be more creative in my own classroom, while realizing that tough standards in no way conflict with fun. The kids really enjoy getting "out" of themselves and to become somebody else in their stories. Thank you to the Art Center for your support and work. We love and need this program! The best part of this project is working with the students. They arrive in January shy and insecure. We get to work with them for four weeks. We laugh, we cry a little, we challenge each other, we talk, and we share stories. We applaud and cheer. We constructively criticize. We dance and move. Mostly, we listen a LOT. Seeing the students grow in confidence is the best part. Sitting back and watching the students SHINE during the performance . . .icing on the cake. Many students would say they "can't" get up in front of an audience. Nyla, Jim and Yukie not only get them up, they teach them to move and audience to laughter and tears. This is the POWER of getting art into the hands, minds and hearts of the students. Beginning in 2007 all the students responded with their own written stories - a goal we have been aiming for since the inception. After all, their lives now are the oral history of the island in the future. 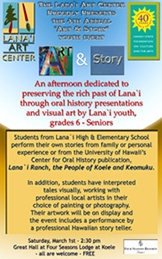 And what a variety - everything from Lanai history to local sports, immigration to family memory. The students who have returned for the second time showed huge leaps in confidence and personal growth. Music and hula enhanced their presentations and for the first time, the students seemed eager to build on past public performance skills. We were able to push them harder and higher. And all want to come back again next year. If this is not a measure of the impact and success of the program, I do not know what is. What did your child like most about this project? * That he got to express other people's memories when they were my age. * She liked seeing the growth of the project from its inception to completion. What did you like most about this project? * Everything, but also that they were recognized with the certificates. * That she gained confidence through public speaking and that she felt happy about it. I liked that it incorporated true stories from our island. 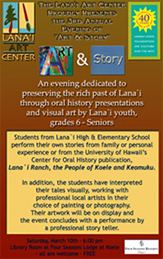 * The training that he received from Lanai Art Center is outstanding. * Helped them be creative in other mediums. What do you feel your child gained from this project? * He gained knowledge by pronouncing words correctly and confidence from being in front of an audience. * She gained a better understanding of her Grandpa and how things improve with practice. * Confidence to try things that she has not tried before. * Maturity, self-respect and confidence. * The program has been invaluable to his ability to compete in the real world. Did you learn anything new about your child? * I learned that he is a committed person and acts very well. * That she likes and appreciates the art of storytelling. Thank you for putting this together. Good job! We appreciate it. * I learned that my son has talent in acting, good to see him expressing feelings about others and the family. * Her compliance, commitment and confidence was overwhelming. * That is she puts her mind to something she's never done before, she can and will succeed. All participants must compose a 50-100 word snapshot of their experience and commit it to memory. Storytellers interview family members or write personal experience stories and commit them to memory. All participants speak before an audience on the Final Performance night. All participants receive movement, dance and improvisational exercises. To the people whose stories are being told.